Andrew O'Donovan, General Manager; Cabot Corp.
Andrew O'Donovan is General Manager of Cabot Supermatels, a Boston-based processor of tantalum and niobium products for the electronics and other industries. Through its Pennsylvania and Japanese manufacturing plants, Cabot Supermetals processes tantalum ore into a raw material used primarily in tantalum capacitor and semiconductor products. In 2010, the company was the first metal processor to be audited and declared "conflict-free" by the EICC/GeSI organized smelter validation program. Mr. O’Donovan has more than 16 years of experience in various parts of the electronics supply chain and is an active member of the EICC (Electronic Industry Citizenship Coalition) Extractives Committee. 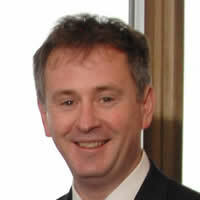 He is a business graduate of University College Cork and University College Dublin in Ireland.